On the afternoon of October 18th, Foreign Ministry Spokesman Kong Quan held a regular press conference. Kong Quan: Good afternoon. On behalf of the Information Department, I wish to give a warm welcome to 23 public servants from Hongkong SAR, who are in Beijing for a training programme. At the invitation of Premier Wen Jiabao of the State Council, Prime Minister Lee Hsien Long of the Republic of Singapore will pay an official visit to China from October 24th to 30th. At the invitation of State Councillor Tang Jiaxuan, Secretary of the Federal Security Council of the Russian Federation Igor Sergeevich Ivanov will pay a visit to China from October 19th to 21st to hold the second round of the Sino-Russian Strategic Security Talks. With that, I would like to take your questions. Q: Japanese Prime Minister paid tribute to the Yasukuni Shrine yesterday when every Chinese was celebrating the return of "Shenzhou 6". What is your comment? Koizumi seems to stress that he was paying the tribute in personal capacity rather than as the prime minister by wearing differently, doing the ceremony differently and finishing the whole process in a very short period of time. How do you react? A: The position of the Chinese Government on the Yasukuni Shrine is very clear. We resolutely oppose that Japanese leaders pay tribute to the Shrine in whatever capacity or name where WWII A Class criminals were worshiped. On your second question, no matter in what way Prime Minister Koizumi was paying the tribute, the nature of his act remained to be the same. China will absolutely make its strong reaction. Q: In a statement Foreign Minister Li Zhaoxing issued yesterday, he noted that Prime Minister Koizumi must shoulder all responsibility of the serious political consequences resulting from his erroneous act. What consequences will there be? A: I wish you could read the statement more carefully. This year marks the 60th anniversary of the victory of the Chinese people against the Japanese aggression and that of the rest of the world against fascism. The international community is reviewing the historic tragedy traumatizing the whole world so that mankind can draw better lessons for which we paid a high price and create a better future. Yet at this very moment, Prime Minister Koizumi insisted on paying tribute to the Yasukuni Shrine where Japanese WWII war criminals are worshiped. It will no only contradict his claimed goal of expressing remorse but also incite the Japanese rightist extremists in their efforts to distort and deny the history. Chinese Government attaches importance to its relations with Japan and has made tremendous efforts to develop bilateral ties. In modern history, the most serious harm to the Chinese people was inflicted by the Japanese militarilism. Bilateral ties can only develop on a solid basis, which is to draw lessons from history and face forward to the future. Japanese leadership has made commitment on the question. But what we saw today is that the commitment was not honoured. Not only they have failed themselves but also they failed the expectations of the Chinese people, Asian people and all the peace-loving people around the world. The erroneous act will definitely lead to serious political consequences. Follow-up: Can you be more specific about the serious consequences? A: If you carefully examine the whole of bilateral relationship and the statement issued by the Ministry yesterday, you will be able to reach an answer for yourself. Q: In his important address to celebrate the 60th anniversary of the victory against Japanese aggression, President Hu Jintao clearly noted that he attached importance to China's relations with Japan. Will there be any change to this position after Koizumi's visit to the Shrine? Secondly, Koizumi expressed his hope to develop relations with China despite his visit. How will China respond? Thirdly, will China take any retaliation in response? Fourthly, Sino-Japanese relations are said to be cold politically but hot economically. Will Koizumi's visit affect the economic relations and trade between the two? A: The position of the Chinese Government on its relations with Japan has been consistent. We stressed on various occasions that an important judgment reached between the two important neighbours from the past 2000-year history is that the two states must live with each other in friendly terms. In the past 60 years after WWII, there were times when the two sides could not develop normal relations. But since the establishment of diplomatic ties, bilateral relations have been developing quite rapidly on the basis of the three important political documents. Both sides believe that we should learn from history and adopt a future-oriented attitude so as to work together for a good future for the two countries and the well-being of the two peoples as well as peace and stability of the Asia-Pacific region and the world at large. On your second question, Prime Minister Koizumi's repeated visit to the Yasukuni Shrine has made the matter very serious. He did not try in real earnest to live up to the commitment he made to the people of the world. His act has undermined the political basis for bilateral relations. On your third question, the statement we issued yesterday made it very clear that he must bare all responsibilities of the serious political consequences as a result of his erroneous act. On your fourth question, as a Japanese correspondent resident here in China, you should have noticed the rapid development of economic relations and trade between the two countries. Last year the trade volume hit US$167.8 billion. Mutual benefit and friendship constitute a significant basis for bilateral economic relations and trade. It is also our hope that bilateral political relations can help create a sound atmosphere and environment for smooth development of economic relations. Q: Japanese Foreign Minister Nobutaka Machimura planned to visit China this month. After Prime Minister Koizumi's visit, will this visit be paid as scheduled? What is the position of China on it? US Defense Minister Rumsfeld will be visiting China, what are your expectations? A: Let me answer your question on Japan first. I will return to the question of Rumsfeld's visit to China when there is no further question on Japan. With regard to the visit of Japanese Foreign Minister, under the current severe circumstances, we do not think it is the right moment. It will not be convenient for China to have him here now. Follow-up: Did China inform the Japanese Government of this decision? What is their response? A: I am not aware of the specifics. Q: Did Japan inform China beforehand on Koizumi's visit? A: I am not aware of that. The Chinese Government takes a firm and clear-cut position in resolutely opposing the visit by Japanese leadership to the Yasukuni Shrine. Q: Can you be more specific on the political consequences and China's decision to cancel Japanese Foreign Minster's visit? A: As a correspondent with the Canadian press, you must be very clear about what happened during WWII. The tragic holocaust happened in Asia has inflicted painful sufferings upon people in China and other Asian countries including Japan. We need to have a correct historical view so that we can draw lessons from history and work together for a better future in the new times. That is an attitude what we often describe as "to take history as a mirror and face towards the future". Proceeding from the overall interest of smooth bilateral relations as well as peace and stability in Asia-Pacific, Chinese leaders and Government have worked hard to make our position known to the Japanese leadership. We hope that Japanese leaders, Prime Minister Koizumi in particular can also proceed from the overall interest and stop acting obstinately. While attending the Asia-African summit meeting in Jakarta on 23rd April, President Hu Jintao especially spared time from his tight schedule to meet with Prime Minister Koizumi and made five proposals for the development of bilateral relations. The meeting was held after Prime Minister Koizumi paid a tribute to the shrine. The Chinese Government and leaders have never given up working on it, hoping that he could finally come to realize his error. But the sincerity and efforts of China have got no positive response from Japan. In reverse, Prime Minister Koizumi turned a blind eye to the efforts of those with vision for the friendship between the two countries and slide even further on the wrong track, to which we wish to express our indignation. As we noted in the statement, Prime Minister Koizumi must bare all responsibilities of serious political consequences caused by his erroneous act. The last paragraph of the statement pointed out in particular that he who goes against the trend of times will be unworthy of the expectations of our ancestors and the trust of future generations and will find himself "lift a rock only to drop it on his own toes". On Japanese Foreign Minister's visit to China, I have nothing new to add. Q: Through what channel did the Foreign Ministry know that Koizumi will pay tribute to the Yasukuni Shrine? Did Japan inform China beforehand? During the third round of strategic talks between China and Japan on 15th, did Deputy Foreign Minister Yachi Shotaro of Japan indicate Prime Minister Koizumi's visit during his meeting with Vice Foreign Minister Dai Bingguo? Is their meeting on 17th morning part of the strategic talks or an opportunity for China to lodge protest against Japan? A: The nature of Koizumi's visit is quite serious. It does not matter much how China got the information. We resolutely opposed to any tribute paid by Japanese Prime Minister in whatever capacity to the Yasukuni Shrine where WWII A class war criminals are worshiped. In the meantime, as a Japanese correspondent, you must have noticed that all major Japanese press except one paper is criticizing him for the visit. This round of strategic talks was held on 17th. It was arranged beforehand. Both sides also agreed to keep it as a closed meeting. Q: I read yesterday's statement. I gather that China wants to differentiate the Japanese authorities headed by Koizumi from the Japanese people in an effort to avoid a full-scale deterioration of bilateral relations. What is your comment? A: You have been in China for some time. You must be well aware of the feelings of the Chinese people and other Asian people towards the Yasukuni Shrine where WWII A class war criminals are worshiped. You must also be aware of the solemn position of the Chinese Government on the issue. Q: It is reported that the meeting scheduled yesterday afternoon between Director-General Cui Tiankai of Asian Affairs of the Foreign Ministry with his Japanese counterpart was cancelled. Is it due to the same reason for which China cancelled Japanese Foreign Minister's visit? A: My information is that Vice Foreign Minister Wu Dawei met with Japanese Director-General in charge of Asia Pacific Affairs and discussed issues related to the Six-Party talks on 16th. Now let me return to the question of Secretary of Defense Rumsfeld's visit to China. I briefed you on his visit last time. He arrived in Beijing at 1 p.m. this afternoon. His major functions will start tomorrow. Chinese state leaders will be meeting with him. Vice Chairman of the Military Committee of the Central CPC Committee, State Councilor and Defense Minister Cao Gangchuan will hold talks with him, Vice Chairman of the Military Committee of the Central CPC Committee, General Guo Boxiong and General Jing Zhiyuan will also be meeting with him. The two sides will exchange views of bilateral ties, military exchanges and international and regional issues of common interest. We hope that this visit will enhance mutual understanding and trust between the two countries and two militaries in particular. We are looking forward to working with the US to make the visit a success and press ahead with stable development of bilateral ties. With regard to his other schedules in Beijing, I can only tell you at this stage that he will go to the Central Party School and Military Academy for meetings there. Q: US Defense Secretary Rumsfeld said on the plane to the reporters accompanying him on his visit to China that China lacks of transparency in its military expenditure and it naturally caused worries from other countries about its military motives. Will you comment on this? A: I have not read the talk or response by Mr. Rumsfeld to reporters you just mentioned. In the past several years, China has consecutively released National Defense White Paper, elaborating China's National Defense Policy, goal and task, the composition of Chinese National Military forces and China's National Defense expenditure, which has gradually helped other countries in having a better understanding about China's national defense. We hope that his talks and meetings with Chinese state leaders and Chinese military leaders and exchanges of views with faculties and students there will help Mr. Rumsfeld have a comprehensive and objective understanding on China's determination in taking the road of peaceful development and china's national defense policy, which will further promote mutual understanding and trust between China and the US. Q: Will the issue of US arms sale to Taiwan be one of the topics in the talks between Chinese leaders and US Defense Secretary Rumsfeld? A: Taiwan issue is the key issue at the core of China-US relations. Proper handling of the issue constitutes the most important basis of a healthy, stable and sustainable China-US relationship. We attach importance to US leaders' commitment to One China policy, the three Sino-US joint communiqués and opposing Taiwan Independence. We hope the US side will strictly honor its commitment on Taiwan related issues. We resolutely oppose any military exchange or cooperation between US and Taiwan including supplying arms to Taiwan. 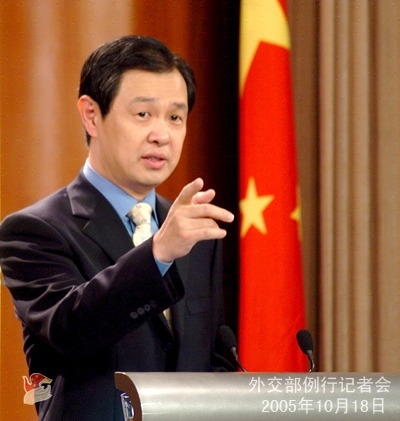 Q: It is reported that President Hu Jintao would visit DPRK in the later half of this month. Can you confirm? A: Up to this moment I have no confirmed, authoritative or authorized information to offer on this. Q: Is China shipping new disaster-relieving aids to Pakistan? A: At the last press conference I briefed you on Chinese Government's first four batches of materials to your Government and people. Since the evening of October 14th, Chinese Government has delivered the 5th, the 6th, the 7th and the 8th batches of materials to your country, including blankets, camps, small power generators, contingency lights, barrels, water-purifying equipments and so on, with a total weight of 200 tons. I have with me some details here. On the afternoon of October 10th, Premier Wen Jiabao met with ambassadors of Pakistan and Afghanistan and charge d'affaires of India. During the meeting, Premier Wen Jiabao asked in particular if there was any special need from the three countries, they should feel free to tell China so that the Chinese Government could take active measures in assisting their rescue work. Ambassador of Pakistan then said Pakistan hoped that China could provide it with water-purifying pills. Upon this request, the relevant authorities of China started to prepare the pills. 24,000 bottles of water-purifying pills and 5,000 bottles of disinfecting powder and pills were shipped to Pakistan at 6pm on October 11th. In addition, there were also water-purifying equipments in the 7th and the 8th batch. This showed that we spared no efforts in helping Pakistani people to get drinkable water. As I know, the 9th batch, also the last one, will be delivered today or tomorrow, including power generators, contingency lights, water-purifying equipments. Meanwhile we will consider earnestly further disaster relief according to Pakistani friends' requests. We sincerely hope that people in your country will overcome difficulties and rebuild their homeland at an early date with help from the international community. Q: It is reported that a Chinese diplomat by the name of Li Bin started his trip to DPRK today. What is the purpose of his trip and what is his agenda? What exactly is his title? A: Li Bin is Ambassador of Korean Peninsula affairs of Chinese Foreign Ministry. He is the successor to former Korean Peninsula Affairs Ambassador Ning Fukui who is now Chinese ambassador to ROK. Your news is accurate. Ambassador Li Bin will visit DPRK from today to the 20th. He will also visit the USA from 24th to 27th, and ROK, 28th to 30th. His main agenda is to have talks, meetings and consultations with his counterparts of the three countries in charge of Korean Peninsula nuclear issue so as to jointly prepare for the 5th round of Six-Party Talks. If there are no further questions, thanks for your presence! See you next time!